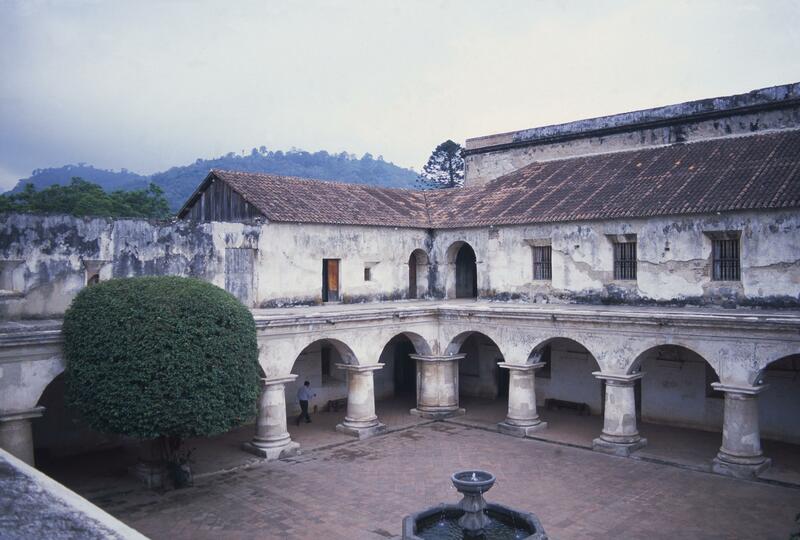 This is the peaceful inner courtyard of one of Antigua’s many convents, Las Capuchinas. In the 18th century, the rooms surrounding included rooms for relatives to talk with nuns through a covered grille, an office for the abbess, workrooms, a dining room, storerooms and a laundry. Nuns gathered in a small chapel off the main cloister to hear services through a grille that faced onto the church abutting the convent. Today many of the rooms surrounding the cloister are public offices. In the 18th century, neither men who were not priests nor visitors would have wandered through the cloister. In the design, the architect chose squat columns and low arcades in order to protect the building from damage from the earthquakes that so often rocked this region. A small group of five nuns came from Madrid to Antigua, with the explicit intention of founding Las Capuchinas. Funds for the initial construction were provided by the bishop of Antigua. The local architect Diego de Porres played a role in the construction of Las Capuchinas, although he was not the master architect for the whole project. The architects of Antigua generally used stone rubble and bricks for their buildings, walls would have been plastered (and often painted) and roofs were made of wood or stone, covered with tiles. Much of the second story seen in this image represents modern reconstruction work. While Las Capuchinas seems to have been an attractive place for nuns, the number of nuns who resided here seems always to have been small, fewer than 40. Moreover, the convent was only occupied for about 40 years—the devastating earthquake that struck Antigua in 1773 led to its abandonment. 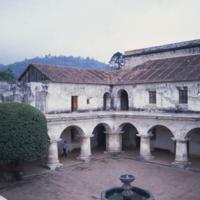 This cloister was one of several in Antigua, and one of thousands active in Spanish America in the 18th century. Convents provided homes to many daughters of the wealthy, as well as shelter and succor to poor and orphaned women. It is true that convents replicated the divisions of wealth, class and ethnicity that so marked the daily world of Spanish America, but they also represent a way of life chosen by, and for more than just a few Spanish American women.